Enchanted Excurse: RING! RING! Is That Courage Calling? RING! RING! Is That Courage Calling? Afternoon Loverlies! I've been on the Bethany House email list to receive chances every month to enter in attempt to receive a copy of a book on their monthly list to be reviewed. I got one finally!! It was an amazing book also! 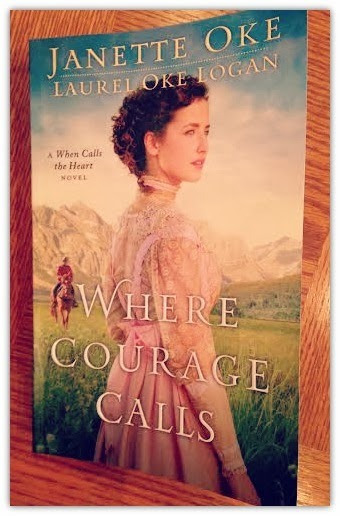 It is called Where Courage Calls by Janette Oke and Laurel Oke Logan. It is one of the When Calls The Heart novels. I have never read a christian fiction before, that I remember. I really enjoyed it. I haven't felt I've done much christian reading lately, I still pray but that's been about it. I need to get closer to God. That way it is harder to get doubts that the devil will bring to me. So I may just have to had a few more christian fiction books to my list of reading. This book is about a young woman named Beth. She has a calling from God to go to Coal Valley and teach to the uneducated children there. Her parents aren't that fond of the idea because she has always been easy to getting sick. They have already lost one child from whooping cough, so of course they are over protected. Also it is odd for a woman to go off on their own and make their own wages around the time the story is written about. Beth's family is rich and growing up they expected her to marry Edward who is also from a rich family. Their families are very close friends with each other. Beth wasn't that fond with him because he hasn't matured and always seemed obnoxious to her. Yet her father has him go with her, to help her make it to the small community. When Beth gets there she finds out she has to teach school in a pool hall, which used to be a tavern. The prohibition is going on at the moment so they had to stop selling liquor. Beth find's she enjoys teaching there and living there. Even though they are not a rich town at all and she has to live without some of the privileges she had back in her old town. This community doesn't haven't electricity and not much of a private bathtub. She makes do with God's help. She kept a scripture her father wrote on a slip of paper for her.She keeps it in her locket for remembering, that helps her get through the struggles of this town throughout the story. The scripture is "I can do all things through Christ who strengthens me." Philippians 4:13. I enjoyed seeing how she overcome the struggles with God's help. This maybe christian fiction, but God does help us with struggles in real life. I believe he does. You just have to have faith, which is easier said then done. Of course this Beth character she has some love interests. I found myself thinking oh she should choose him, no she should choose this one! lol Silly but I kept wondering who she would fancy. She wasn't all worried about it though, she knew whoever God chose for her she would love. Which is how it should be God chooses who our mate is. I may get frustrated at my husband at times, but I always think and I feel I know God chose him for me. Which I am thankful. My husband is very sweet to me and I know he loves me. This book I loved reading because whenever she had tests and struggles. She would mention she should pray to God and etc. It just reminds me how I should be through struggles. I think it is a very sweet story. I even noticed it's a tv series on hallmark. So I'm definitely going to see how to get my hands on theses series to watch. lol I think I would enjoy it. There was a quote in the book I wanted to post. I love this! Molly, she's an older lady who owns a type of bed and breakfast that Beth is staying at while in Coal Valley. She gives Beth advice also throughout the book. I love here, what she explains to Beth so much I just have to share. "Now, dearie, ya gotta take care. That word should, it's a slip'ry one. Who gets ta measure shoulds? Only God gets ta say. If He says ya should, then ya mind him. If folks say ya should--ya jest go back an'ask God. Don't need more'n that to measure up to." She smiled to herself and reached for the next plate. "Good thing 'bout gitting old--ya don't think near so much 'bout what folks think of ya--what they say ya should do. Ya spend more time wond'rin' what you still can do. Wish I could go back over my own life and not bother with all the silly things folks said I should. Sure woulda made life more simple--less confusin'." This book is simply about courage and having that faith in God. Now go get your copy of this book and read it! I don't believe you will regret it! :) Ta Ta For Now! Sounds like a lovely story about a courageous woman. I am always mixed when I read about women in this era. I feel like I would never survive, but I would love to try. Great review. Thank you!! And yes I keep wondering that also. I think about if we all had to survive like they did back in the olden times. where you make your own fire and hunt your own food. How well would I survive. I sometimes think if I was able to learn I would attempt it. Cuz you never know with how crazy the world is today when you might have to survive like this. lol I get a bit paranoid. oops.